Women love the notion of staying young and looking radiant at every stage of their life be it body, face or mind. 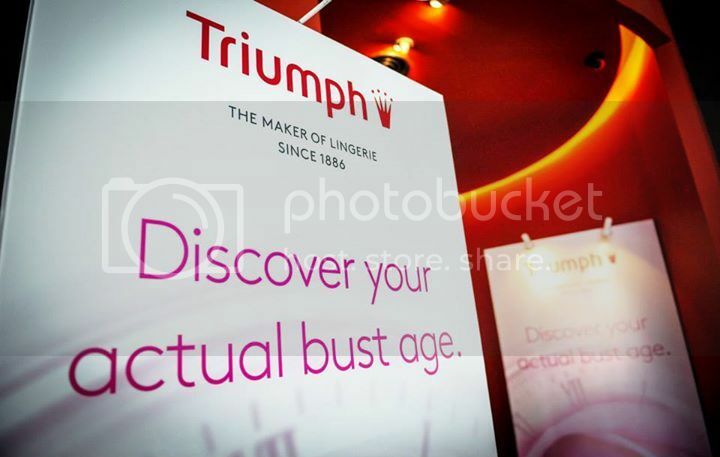 Triumph launched Forever Young, a new collection designed specifically for a timeless, youthful look with perfect shape and support at every stage of a woman's life at Black Box, Publika last week. Since I am entitled to bring a guest, I brought Yuh Jiun along with me. I was not sure that who would be attending this event. However, I was lucky to meet up with Cindy, Kelly, Jessica and the rest. 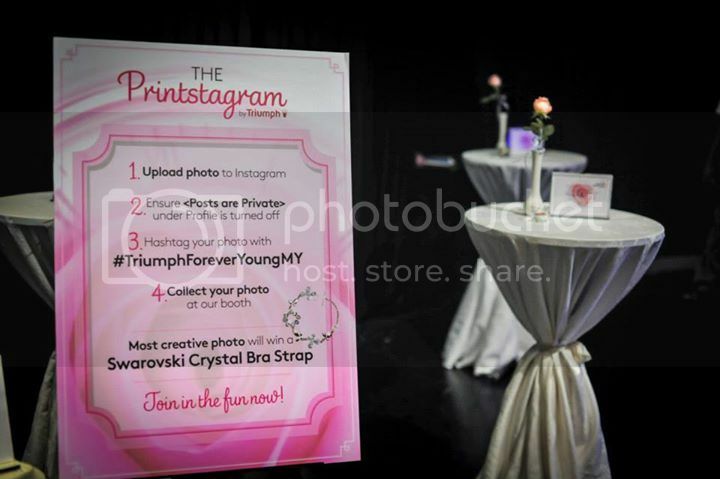 (: There's an Instagram contest for all the guests whereby the most creative photo taken during the event would win a Swarovski Crystal Bra Strap! 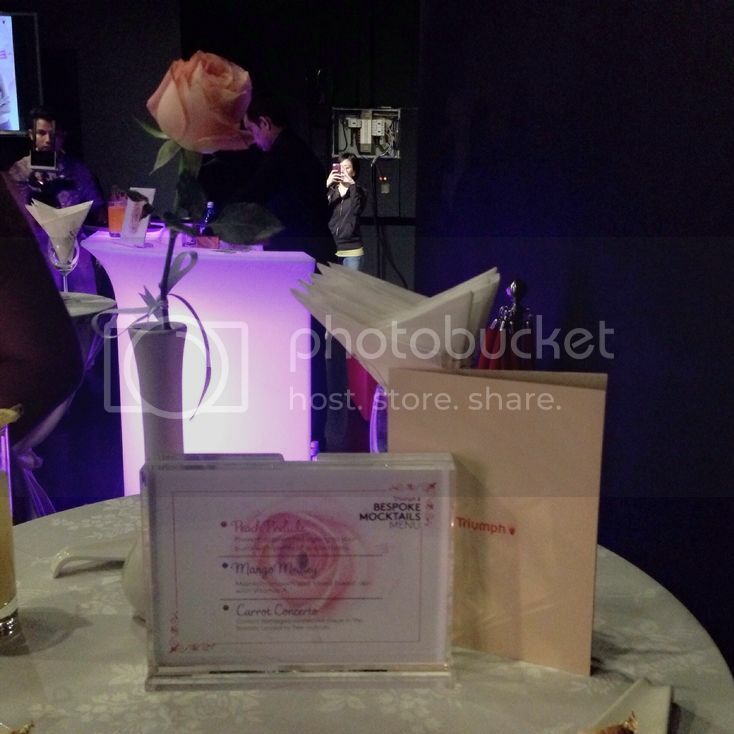 The launch was hosted by the Malaysian TV personality, Daphne Iking. Before the Forever Young collection started, women from different ages and walks of life had their discussion on the bust aging concerns. Dr. Harjit Kaur who is one of Malaysia's top 10 Breast Consultant joined in the discussion and enlightened the panel, guest and media on breasts aging and preventions. She was joined by Maria Tunku Sabri, Carey Ng, Kate Ang and Daphne Iking who hosted the discussion which also highlighted on how Triumph's new collection can help women bring back and maintain their youthfulness. L-R: Maria Tunku Sabri, Carey Ng, Daphne Iking, Kate Ang and Dr Harjit Kaur were discussing about their bust aging concerns. Through the discussion, I realised that the breasts age much faster than the rest of our body. According to a study done by Steve Horvath from UCLA, it confirms that breasts age much quicker than other parts of the female human body, some of which start at the age of 25. Hence, when breast sagging begins, women tend to look much older than they already are. Therefore, Triumph unveiled the secrets to a timeless youthful look with the new Forever Young collection. The new collection was aptly presented and showcased to bring out the unique patterns which has been tailored to give women a rounder, firmer, fuller and a more youthful appearance. Forever Young collection is an innovative shaping fabrics with stunning lace or mesh combinations and advanced design which instantly lifts and contours for a fuller, more voluptuous busy shape and a younger profile. Available in a pretty palette of autumn shades, the collection offers a variety of styles, each individually tailored with its own unique pattern for different levels of support including Natural, Shape and Super. With Forever Young, instantly transforming your décolleté is as simple as choosing a bra. The Natural Support features elegant mesh cup edges that blends in beautifully with bust contours for effortless enhancement. Shape Support has an advanced diamond cup design for a rounder bust shape and a French cleavage. New innovative soft U-bone at the side panel provides comfortable and extra stable support. Larger busted beauties will love the Super Support series, delivering all the shaping power ever needed - smoothing high side panels, additional layers of crescent fabric and a 'stay-in-place' back design with non-slip straps. The Forever Young Collection also includes a series of shapewear that is made with advanced Novarel Firming fabric, a nylon micro-fibre which contains active principles that facilitates skin shaping, firming and toning. It has also been scientifically proven that in the span of 28 days, 95% of women respectively, have been able to achieve softer skin and a lifting effect was experienced. Alongside the Novarel Firming fabric, the shapewear series also consists of liberating fabric from Lycra Beauty that has an amazing stretch and recovery ability. It ensures strong shaping and support while giving women the freedom to move! The guests were treated to canapés after the show, whilst getting the chance to touch and feel the collection in a more intimate setting. There was also a live mannequin display after the show, giving the guests a closer look at the beautiful collection. The Forever Young collection will be retailing at RM229 onwards from 1st October 2014 at Triumph boutiques and counters at all major departmental stores. For more information on the latest collection, check out their website at www.triumph.com.my or Facebook page at https://www.facebook.com/triumphmalaysia.